BUYER QUALIFICATIONS: Each time that you LOG IN, you will be able to see our wholesale prices and place orders. In order to LOGIN, you'll need to create an account by registering and creating a password. And it is as easy as 1, 2, 3. The first step is to click on the link "Log In" that is on the top left side of this or the Home page. The second step is to fill out the customer profile part of a form with things like your name, email, address, etc. You'll need to select and confirm a Password of your choosing. As a qualified reseller, you will also be asked to enter your Tax Resale number. When done, click on "Submit". Very shortly thereafter, you will receive an automatic email notifying you that Customer Profile was received. Step3, You will receive another email confirming that your account has been activated and you can start shopping. Each time you Log In, you'll be asked for your email address and password. GENERAL INFORMATION: Prices are subject to change without notice and items may be discontinued at any time. The materials used in our products are mostly natural and can be sewn or glued. 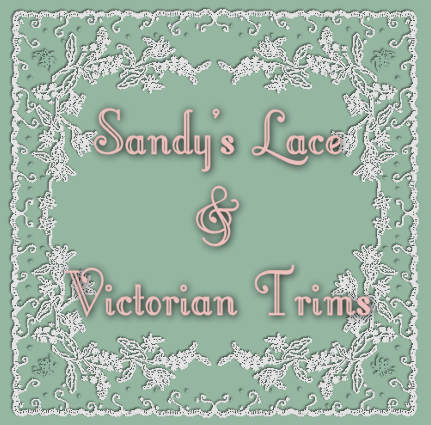 The majority of French and English lace is 90% cotton and 10% nylon. Swiss Embroideries are 100% cotton. All items that are designated "vintage or old" are 100% cotton. The color descriptions of ribbons, trims and lace are difficult. I generally stick with the names that the mill used. Dye lots do change from time to time and sometimes vary quite a bit. Unfortunately I have no control over this. Although, there is no dollar minimum requirement to order, there are minimum lengths, put ups and quantities on most items. SPECIAL ORDERS: Please allow up to two weeks to receive your order. We also do trade shows and can be gone for weeks at a time. So, if a particular item needs to be delivered at a specific time (ie for a class), please order early, so you aren't disappointed! Just specify that the shipment and billing is to be delayed to your specific date. SHIPPING/HANDLING: Shipping and handling charges within the United States is $6.00 minimum. If your order is heavier than minimum (one pound), the shipping charge is then the actual cost plus $3.00. Charges for other special handling (overnight, etc.) are additional. Preferred shipping for Foreign orders is Global Express, or Global Priority, when INSURANCE is available. Foreign shipping charges are actual plus $3.00. Global Express allows for good tracking and seems to clear customs faster. PAYMENT: Credit cards (VISA or MasterCard) payments are acceptable when in US funds. Make Checks/Money Orders payable to "Sandy's" and they must be in US funds and drawn only on a US Bank. There is a $20.00 charge for a returned bad check. WE HAVE NO PROVISIONS for "open accounts". BACK ORDERS / SUBSTITUTIONS / QUESTIONS: We find it best NOT to have "back orders"! And suggest you reorder when an item comes back marked "out of stock". We also will not substitute merchandise or colors unless you specifically ask us to. RETURNS / CREDITS / REFUNDS: You must ask for authorization BEFORE returning an item. If there is a problem with your order, please email, write or call within 10 days. Merchandise returned must be in a saleable condition. Sorry, no returns on SALE ITEMS. All other returns are subject to a 10% restocking charge. You will be sent a credit for overpayment or items no longer in stock or discontinued. Credit slips must be returned to receive credit or a refund check. If you wish a refund instead of credit, please so state on your order.